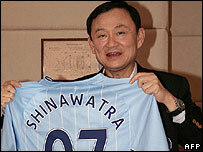 Thailand's Supreme Court has agreed to hear corruption charges against former Prime Minister Thaksin Shinawatra. The ex-leader and his wife Pojaman were named in a case involving allegations of wrongdoing in a land deal. Mr Thaksin, who has lived abroad since he was ousted in a military coup last September, has denied any wrongdoing. The first court hearing is due on 14 August. Several other cases of alleged corruption and abuse of power are pending against Mr Thaksin. "The Supreme Court political crime section accepts the case," Tonglor Chomngarm, the Supreme Court's deputy head, told reporters. The charges relate to the purchase of a prime plot of land in Bangkok in 2003 by Mr Thaksin's wife Pojaman, for 772m baht ($24m; £12m). The land, owned by a government agency, had earlier been valued at 2.1bn baht ($66m, £32m). Mr Thaksin is accused of illegally influencing the deal. If convicted, the couple could be jailed for up to 13 years and face a fine. Prosecutors told reporters that Mr Thaksin and his wife had been ordered by the court to attend the opening arguments. The former prime minister has remained abroad - mainly in London where he has a house - since last year's bloodless coup. He said last month that he would only return to Thailand to face corruption charges if he could be sure of a fair trial. Mr Thaksin's solicitor, Noppadol Pattama, said on Tuesday that his client would not be returning for the opening arguments. "Both of them will fight the case, but as of now the two defendants will not return to fight the case on the grounds that the judicial process is still being interfered with," he told the AFP news agency. However, a conviction in Thailand could affect Mr Thaksin even if he stays in exile, the BBC's Jonathan Head in Bangkok says. His recent acquisition of the British football club, Manchester City, is still subject to the Football Association's "fit and proper person" test, which specifically bars people convicted of corruption, even in a foreign court, our correspondent adds. Military leaders who carried out last September's coup cited corruption and abuse of power in Mr Thaksin's government as their justification. The billionaire former prime minister and his family have since been under investigation by an anti-graft panel set up by the military-installed government. Other charges currently pending against Mr Thaksin include concealing his assets and implementing policies that favoured his family's business empire. More than $1.5bn of his assets have been frozen. Mr Thaksin argues that the investigation and charges are politically motivated.